A number of specialists to governmental and private banks play an important role in moving the market and the reconstruction of war-stricken areas with organizing terrorist ISIS through granting loans for citizens to start their own businesses and rebuild their homes and businesses affected. The Iraqi banking system is composed according to the CBI site of 45 banks between Government and foreign private and spread throughout the country. "the Central Bank's decision to grant loans to industry, housing and agriculture is very important and will play a role moving the market especially after launching her website. "the Iraqi banking sector suffered an unjust campaign during the past period because some politicians gossip and some characters are far from reality." "loans to citizens and practical benefits will be reflected positively on the country's economy. He pointed out that "private banks can launch loans for citizens to move the market and support the poor through small loans especially to poor rate currently stands at 10 million and this too big because of the circumstances of the country and displacing nearly four million from conflict zones. The Iraqi economy now through the depression stage 2014 first shocks as low oil prices and the second out of his control, reflecting increased spending on the military, "especially" the country play a big role. On the other hand, the Executive Director of the Association of private banks, to Gibraltar, that "private banks long ago met with reconstruction of the liberated areas of organization of ISIS and collected more than one billion dinars to support fund and set up a Conference for the reconstruction of the liberated areas". "The foreign currency Auction window legal case legislated by Iraqi law and monitored by the Central Bank, no bank can enter in the window across the papers to the Central Bank, to more criticism directed to participating banks unfounded and lacked documentation, and calls to reduce foreign currency sold in the window needs to reduce imports because the country imports very formidable and saw that when the Central Bank cut its daily sales window to 75 million dollars reflected negatively on the market with Dollar was about 25%. 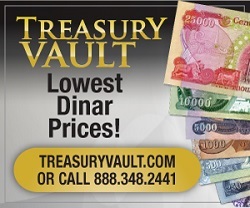 He noted that "cancel window selling irrational and incorrect and will cause a dramatic rise in the dollar, the Central Bank's target of this procedure providing the dinar to the Treasury that receives oil money dollar currency and significant financial obligations including dinar staff salaries and State requirements, but credit was implemented rather than sell window quite a bit, especially since he will protect hard currency and will make the country enter her real goods." Iraqi Central Bank Governor, on the relationship, he stressed that many factors affecting the banking sector including security and political situation, adding that some foreign banks refused to deal with Iraqi banks, pointing out that 77% of the mass of cash outside the banking system. "five Iraqi banks have problems with their customers and Central Bank tries hard to solve, and within months the banks unable to emerge from the banking business". "There was a rebellion by some banks repay clients for banks this is very serious and must be addressed in every way", stating that "the Central Bank's payment system is one of the best systems in the world and it is being reviewed by the World Bank. He noted that the percentage of 77% of the existing money supply held by citizens in their homes which is outside the banking system, which shows that the proportion of beneficiaries of the banking system is 10% of the population of Iraq, "pointing out that"
large monetary bloc have citizens from entering the banking system to extend the Bank's work and increase manpower operates services"